Ravka has been divided for centuries by what is known as The Fold. The Fold is a land of nightmares and shadows with creatures called volcra, a mix in my mind between a giant raven and a vulture. The Fold was created by a man known as the Black Heretic and has since ruled the way the country is run. Set in a kind of pre-revolutionary Russian state, Shadow and Bone is the first novel in the Grisha trilogy by Leigh Bardugo. I have to say that I liked this novel a lot. Many of the reviews I’ve seen thus far about this book and the trilogy as a whole have been either loved it or hated it. There doesn’t seem to be much middle ground for these books. I really like the mix of Russian history in the novel and the folklore. I really enjoyed trying to guess what part of Russia’s history the different characters represented. There’s pre-revolutionary Russia ruled by the autocrats, here the Lanstov’s, a mix of Lenin and Stalin era Russia with the Darkling and his fanatic followers, and a Rasputin type character in the Apparat. It was amazing the way Bardugo was able to blend and mix Russian history and create this fantasy world of Ravka. Not only does she bend and morph Russian history, she takes Russian folklore and creates something new and different. The Grisha and their centuries old powers, not magic exactly but more ingrained in them as a person. They practice what is called the small science, not creating but using what is already in the world to enhance their gifts. Creating magic in this world is soul destroying. Most of the comments I’ve seen are in regards to the protagonist Alina Starkov, the savior of Ravka. Many think she fails as a heroine but I found her flaws refreshing. She’s a convincing teenage girl, just trying to fit in with those around her. In trying to fit in, she never realizes the power that she possesses. She has a great need to belong and the relationships she forges are for life, especially her relationship with Mal. She was never trained to rule or be a hero and, refreshingly in my mind, doesn’t magically become one once she realizes she has Grisha power. She has to be groomed and trained. So many of the fantasy YA heroes and heroines just magically become so sure of themselves and their powers. I really liked watching Alina grow into her own and second guess herself. She makes mistakes, some devastating, but manages to bounce back. She looks to those around her for guidance and has the foresight to rely on others for their expertise, not just her own. This doesn’t always go well but, again, it’s nice to see a heroine be able to make mistakes and be indecisive. 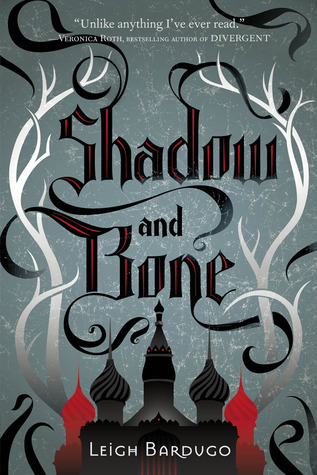 Shadow and Bone does still follow the typical YA fantasy formula but has enough intrigue, especially with the layers of Russian history, to keep me reading. I can’t wait to see what the next novel in the trilogy has in store for Alina, Mal, and the Darkling. Stay tuned for the review of Siege and Storm. Happy reading!